"A house is built by wisdom and becomes strong through good sense. Through knowledge, its rooms are filled with all sorts of precious riches and valuables." 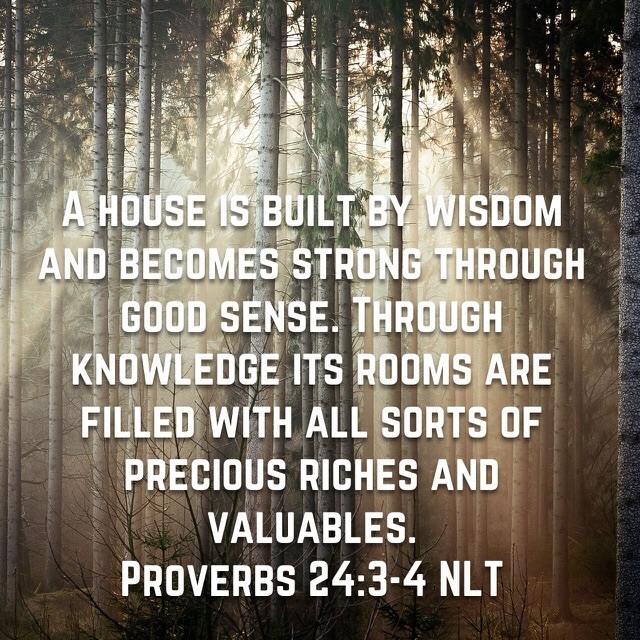 Just as a house is built with wisdom, our lives are built by wisdom. The older I get, I trust that my faith is becoming stronger and that I have more good sense. Each room in my life-my mind, my heart, can be filled with all sorts of precious valuables. They are valuable because they are precious gifts from God: eternal life, love, joy, peace, patience, kindness, goodness, faithfulness, gentleness, self-control, grace, freedom. The list could go on. What riches do you see in your life or in those around you?